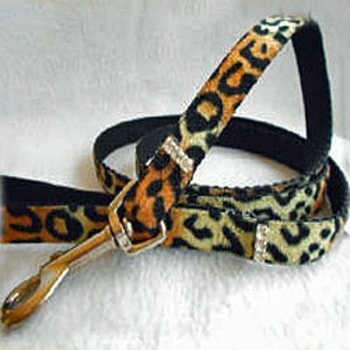 This leopard leash is 5/8" wide and 4' long. The leopard bow is made with velvet and a choice of accent stones rows, shown is the 1 row. Please choose your option in the drop-down menu. A matching dog collar is available. Please note: This is a custom dog lead. There are no exchanges or returns on this item. *Your lead is custom made and will ship within 14 days of receiving the order.